Q: According to reports, US Deputy Assistant Secretary of State Alex N. Wong of the Bureau of East Asian and Pacific Affairs is currently visiting Taiwan. He is going to address a meeting tonight which will also be attended by Tsai Ing-wen. Is the Chinese government upset at the fact that a US official is visiting Taiwan so soon after the US side signed into law the "Taiwan Travel Act"? 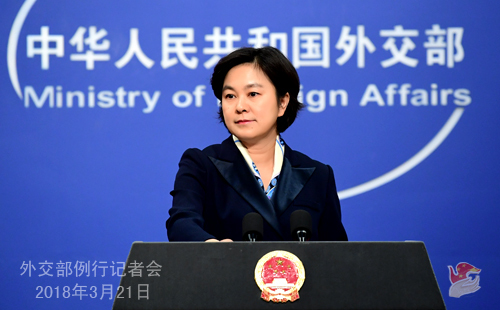 A: China firmly opposes the so-called "Taiwan Travel Act" and has lodged stern representations with the US side regarding the situation you just mentioned. 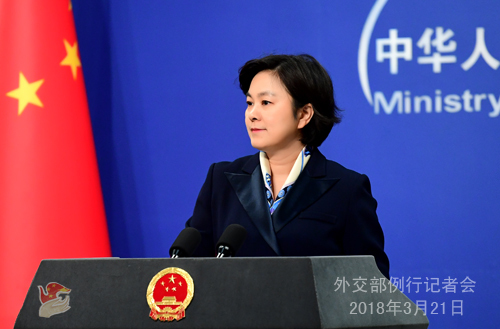 We urge the US to abide by the the one-China principle and the three joint communiqués between China and the US, stop pursuing official exchanges and contacts in any form with Taiwan, and cautiously and properly handle Taiwan-related issues so as to avoid causing severe damage to the China-US relations and cross-Straits peace and stability. Q: According to a recent CNBC analysis using financial search engine, senior executives of many transnational companies, including Honeywell, HSBC, Siemens, Rio Tinto and Schneider Electric, cited the Belt and Road Initiative as a rare opportunity for business growth and believed it will create further opportunities in the infrastructure and construction space and has increased significantly their presence in relevant region. They are eager to seize such opportunities provided by this Initiative. What's your comment on this? A: I have noted relevant report you mentioned as well. The positive attitudes and viewpoints of those established US and global enterprises cited in the CNBC analysis using financial search engine have shed light on the major opportunities that the Belt and Road Initiative provides to countries and corporations around the globe and the widespread popularity of the Initiative. 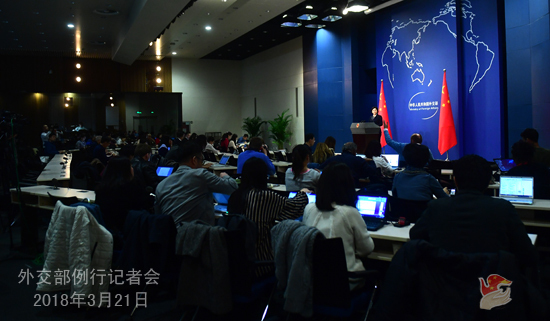 With the advancement of the Belt and Road Initiative over the past five years or so, an increasing number of countries, international organizations and enterprises have cast a vote of confidence and support for the Initiative and benefited from the equal, open and inclusive cooperation under the Belt and Road Initiative. We stand ready to work with various parties and continue to follow the principle of extensive consultation, joint contribution and shared benefits to create further opportunities for the development of countries and global economic growth. I believe any far-sighted enterprise with strategic perspective will surely seize the opportunities they see in the Belt and Road Initiative. Q: According to the Wall Street Journal, forty-five trade associations, including the US Chamber of Commerce, the National Retail Federation and the Information Technology Industry Council, signed a petition letter sent to the US government, urging it not to move forward its tariff plan on Chinese imports, as it would hurt the US economy, consumers and competitiveness. There are also reports saying that forty-three top economists at the IGM Forum held by the Chicago Booth School of Business believed that imposing tariffs will not improve Americans' welfare, but may prove to be harmful to the majority. According to the European media, the US trade representative said that if the EU wants to be exempt from the US tariffs on steel and aluminum, then it must ally with the US in fighting steel overproduction by China. What is your response? A: Everyone is following the issue of the US trade frictions with other countries, including with China, and concerns have been voiced on international trade order and world economic stability. We have made clear our position on this issue on different occasions. I would like to further highlight a few points in response to your question. First, the China-US economic relations are in nature mutually beneficial, and such relations have opened up immense markets and created a significant number of jobs for the two countries over the course of forty years. Trade with China has also considerably lowered the average expenditure burden for US families. I have some numbers for you. In 2015, China-US trade cooperation helped each American family save 850 US dollars on average. If the US had benefited nothing from such relations, how could the China-US trade have sustained such rapid growth. Second, China never intends to seek surplus. The current trade imbalance between China and the US is a result of many factors, and shall be addressed by opening markets wider to each other and making the pie of cooperation bigger, instead of by waging a trade war or forcing others to buy or sell. Third, trade war will only produce losers. The legendary impenetrable "super armor" that shields one from any harm simply does not exist. You mentioned petition from the US trade associations, opinions of the US economists and reactions of other countries. I believe that their responses made the point quite clear. According to a US opinion poll, half of the US population opposes raising tariffs on steel and aluminum products. There are also people believing that imposing tariffs would deliver a heavy blow to downstream industries of the US manufacturing sector, causing a loss of 180,000 jobs of other economic sectors. Fourth, we want no trade war with anyone, but if our hands are forced, we will not quail nor recoil from it. Therefore, if the day did come when the US took measures to hurt our interests, we will definitely take firm and necessary countermeasures to safeguard our legitimate interests. Q: There are reports that Chinese State Councilor and Foreign Minister Wang Yi will visit Moscow and meet his Russian counterpart Sergei Lavrov. Could you please confirm it? If yes, what are the main topics of their talks? A: As is known to all, China and Russia enjoy very good relationship. President Vladimir Putin has sent his warm congratulations to President Xi Jinping immediately and President Xi Jinping has also congratulated President Putin on his reelection instantly. Under the strategic guidance of the two heads of state, the China-Russia comprehensive strategic partnership of coordination has been operating at a high level and embracing new opportunities. We have full expectation for and every confidence in the future of China-Russia relations. Moreover, State Councilor and Foreign Minister Wang Yi has stayed in close touch with his Russian counterpart Sergei Lavrov. As for the specific visit you asked about, I have no information at hand for now. We will let you know in due course once we have it.